Old Base Version - This is a standard version of the Microsoft Dynamics NAV 2009 database. Old Custom Version - This is the old base database plus the customer's changes and add-on solutions. New Base Version - This is a standard version of the Microsoft Dynamics NAV 2013 database. After merging customizations into the New Base Version you will have a New Custom Version, which is the objective of the code upgrade. 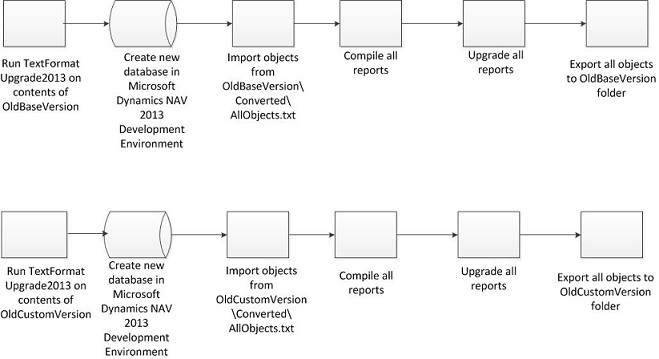 The product of the code upgrade is a .fob file that contains all Microsoft Dynamics NAV 2013 objects (including customizations), which you will use during the data upgrade. Customers can continue to work with the Microsoft Dynamics NAV 2009 database (the old custom version) while you upgrade the code by using a copy of their database. However, we recommend that you avoid making any additional customizations to the old custom version while you work on the code upgrade. Start by identifying any customer-specific changes that have been made to the customer’s old custom version, then implement those changes in the new base version. To identify the customizations that the customer has made, you must have an old base version to compare with the old custom version. This old base version must be the English (United States) version that you received from your local Microsoft country/region office. The following procedure shows how to compare the objects in the customer’s old custom version with the old base version, and then implement the necessary changes in the new base version. The procedure assumes that you already have Microsoft Dynamics NAV 2009 installed. Create three folders on the computer and name them: OldBaseVersion, OldCustomVersion, and NewBaseVersion. Complete the following series of actions twice: one time for the old base version of the Microsoft Dynamics NAV 2009 database, and one time for the old custom version of the Microsoft Dynamics NAV 2009 database. 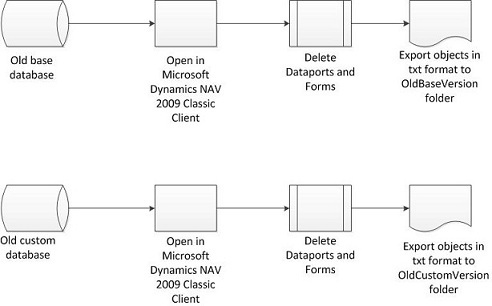 Open the database using the Microsoft Dynamics NAV 2009 Classic client. Delete all Dataports and forms from the database. Export all objects in txt format into the appropriate folder: OldBaseVersion or OldCustomVersion. Uninstall Microsoft Dynamics NAV 2009. Install Microsoft Dynamics NAV 2013. Choose the Developer Option. Complete the following series of actions twice: one time for the old base version, and one time for the old custom version. Run the TextFormatUpgrade2013.exe tool on the contents of the OldBaseVersion and OldCustomVersion folders to update all references to forms to be references to pages. For more information about the TextFormatUpgrade2013 tool, see TextFormatUpgrade2013 Tool. Create a new database in the Microsoft Dynamics NAV Development Environment. Import all objects. The TextFormatUpgrade2013.exe tool has saved the objects in a subdirectory of the original folder: C:\OldBaseVersion\Converted\AllObjects.txt or c:\OldCustomVersion\Converted\AllObjects.txt. Compile all reports in the database. Some reports will not compile because they use System Tables that have changed in Microsoft Dynamics NAV 2013. Fix the errors before you continue. Alternatively, you could delete any reports that are not needed in Microsoft Dynamics NAV 2013 or delete reports that would be easy to re-create. Upgrade all reports. For more information, see How to: Upgrade Reports. Export all database objects back to the respective directory: OldBaseVersion or OldCustomVersion. You are now ready to start analyzing and merging changes.